Another event post! Last Saturday I was invited for a blog launch party from a Dutch girl called Lizzy from www.lizcachel.com . I must say I was pretty impressed by the way she hosted her blog launch party. It was hosted in Rotterdam at two next door fashion stores, which I really have to revisit because they had the cutest accessories and fashion in their stores. This week was a pretty busy week and this post is about one of the events I went to last Friday. It was the Relaunch Party from River Island in Amsterdam. I always love a good excuse to visit one of my favorites cities and spent this day shopping and visiting the Re-opening at RI. 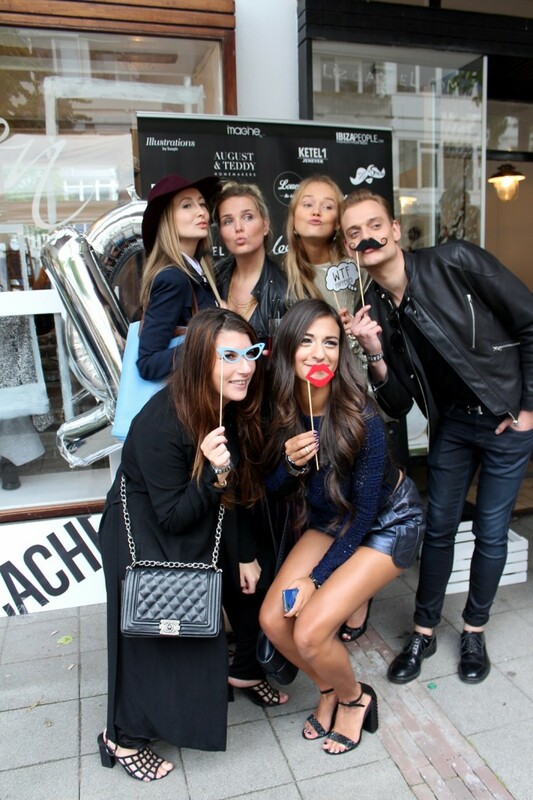 There were plenty of fun stuff in store, like a photobooth, a beauty bar, performances by DJ’s Geza Weisz, Manuel Broekman, an exclusive performance from Foxes and last but not least Negin Mirsalehi my fav blogger was at the re-opening for some styling sessions in store. I must say I am loving this new trend, even though we are heading to fall now and leaving summer behind. Luckily we are bringing a bit of that fashion with us. And with that I mean the white, beige, light and soft toned colours. I think that that colour palet is so chic and sophisticated and I also think that this colour palet is very suitable for fall/winter. When I think of winter I immediately think about clear white snow, beautiful (fake)fur coats, beige nice warm and comfy knitted sweaters and much more. And this year’s latest trends showed pretty much the same. Even though summer seems to be over in here, I’m still not ready for fall yet! I still have so much summer outfits that I haven’t worn yet, I hope the weather will get better before fall really starts! Summer is my favourite season of all, I love dresses and skirts and all the fun summer fashion that goes with it! When the sun is up I instantly feel happy. This was one of those days, I went to one of my fav cities and spent the midday enjoying the good weather with a nice cold drink on a little terrace in Breda. Today my boyfriend and I went to Amsterdam, we went there to spent the day shopping and to visit the Marc Jacobs Tweet shop in the Bijenkorf ( a Dutch warehouse). Sadly we didn’t win anything in the tweet shop but we also didn’t leave empty handed. After we tweeted a picture with Marc Jacobs items we got a nice goody bag. After that we went shopping, I’m curious what your favourite spots in this amazing city are. Sadly this was our last evening in Ibiza. But it was magical, we ended our vacation with a romantic evening on the rocks and beach in San Antonio. In San Antonio it is a must to see the sunset, you sit by the shores of San Antonio and admire the stunning sunset with Dj’s playing loud music in the background from the sunset bars. There are all kind of sunsetbars at the shores of the bay of Caló des Moro in San Antonio. There are hundreds of people there who watch the sunset vanish below the horizon.